Items 50- out of displayed. Traders, welcome back to our latest video analysis regarding BTCUSD! As we know, BTCUSD made a higher degree three-wave pullback away from 11824 February highs, which can now be coming to an end. Specifically we see price little by little picking up from around 7600, and also in minor five waves, which could already be an indicator for more upside. Check the video for a closer look and better understanding! We highlighted and warned about deeper pullback on BTCUSD and friends and it's happening since this Monday. When everyone turned up for 15k with stick to wave structure which now shows that wave C can be moving down into every interesting 8k-9k area. 10 year US notes can be trading at the end of a higher degree wave III. Specifically we see price unfolding an overlapping price movement within sub-wave 5 of three, that looks more and more like a EW ending diagonal. The speciality of this pattern is that it can cause a sharp a strong turn into the opposite direction, in our case into corrective wave IV, which could see limited upside near the 121.09 level, at the starting point of the pattern. Possible support zone is seen at 119'20, where red waves 1 and 5 would become equal. That said, divergence on the RSI also suggest a potential turning point. Bitcoin remains on track with the clean Elliott Wave structures and text book patterns as price once again followed our prediction perfectly when it turned down into a pullback as highlighted in past report. In a new report we will again take a look at major crypto currencies, but what you will notice is that BTC, ETH and LTC have much better looking structures compared to XRP, DASH or BCH per example. The idea is to stay focused on markets with clear patterns and track different possibilities on other, non-directional markets until we get more price data. We would appreciate your feedback so that we can improve in the future. Again, Crypto market followed our views very well. We have seen a nice recovery recently on BTCUSD and friends. Bitcoin made five waves up which means new pullback can be coming, maybe even some deeper decline on others, not that strong cryptos such as XRP per example. Also, make sure to keep an eye on US stocks market, NASDAQ100 which may cause a drop on cryptos if stocks starts to move south. In fact, technical picture for stocks is bearish. 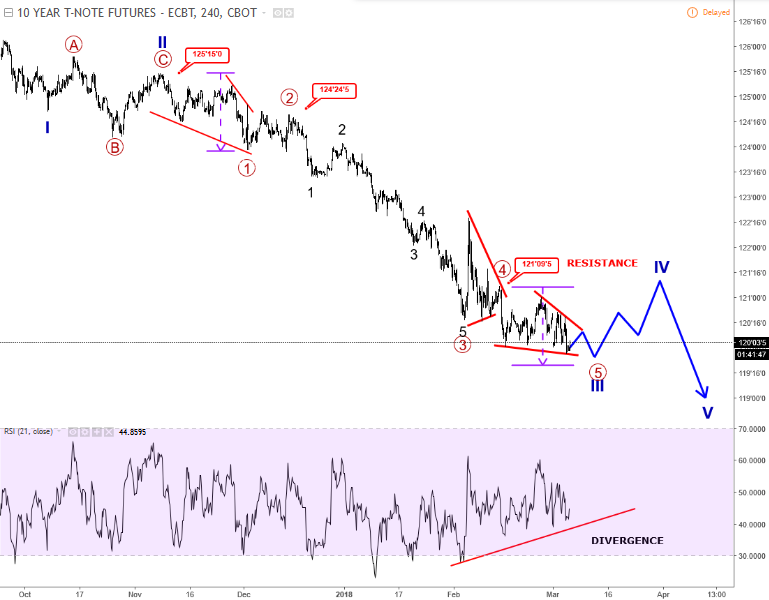 When dollar is strong, we love to focus on clear bearish pattern, against some weak currencies which can be Aussie if we consider that five wave fall through January and down to Feb 09 low. More importantly, a bounce from there was slow and overlapping in seven waves; a clear corrective recovery which stopped at 61.8% Fib level. 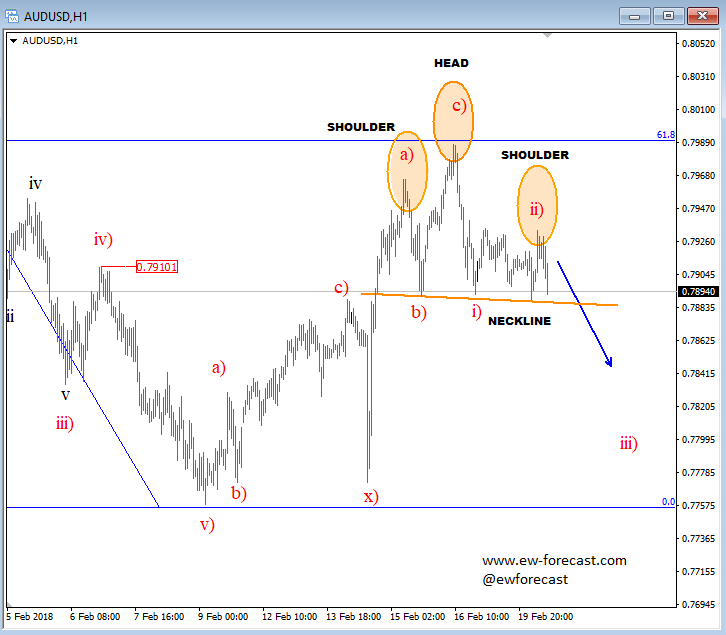 Also there is a chance for a H&S top formation if neckline is broken which can cause a drop down 0.78. 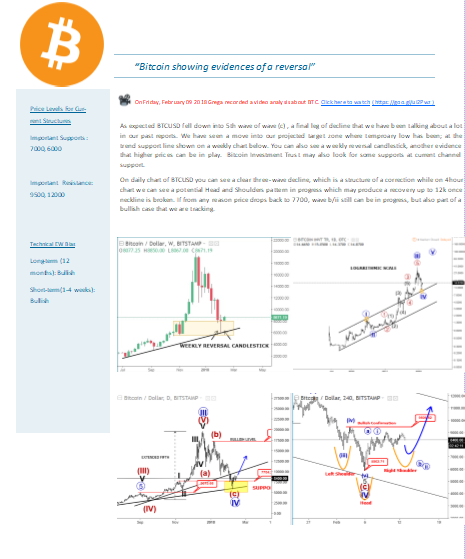 Bitcoin and other correlated major cryptocurrenices moved exactly into our support levels that we highlighted several times in our past updates. In fact, we have seen a perfect reaction higher from those levels from where we can see some interesting structure that can produce more gains.